This guideline provides best practice recommendations for workplace parties to consider when fulfilling their responsibilities under the Occupational Health and Safety Act (OHSA) and Regulation 854 (Mines and Mining Plants) regarding apparel worn by workers to improve their visibility while working on surface and in underground mining environments. Section 262, Regulation 854 (Mines and Mining Plants) under the OHSA covers the important requirements. Section 263, Regulation 854 (Mines and Mining Plants) under the OHSA covers the important requirements. Sub-section 12(3) of Regulation 854 (Mines and Mining Plants) under the OHSA and clause 28(1)(b) of the OHSA cover other requirements. Although the first high visibility safety apparel was developed in the 1930s, it was not utilised as a safety measure for workplaces until the British railway industry adopted its use in 1964. 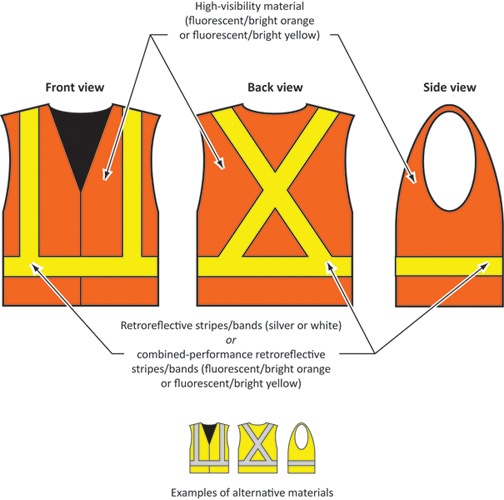 Beginning in 1979, Ontario construction workers who directed traffic or were endangered by vehicular traffic were required to wear a vest of ‘reflective fluorescent and blaze orange or red.’ Specific provisions on HVSA were first introduced in Regulation 854 in 2000. Fatalities, injuries and ‘close calls’ have occurred in mining workplaces because objects or equipment have come into contact with workers. In these situations, the lack of visibility of workers in the workplace may have been a contributing factor. The use of HVSA can help prevent these kinds of workplace incidents from happening in the future. The use of barricades, signs, increased lighting, procedures and training will help to minimize the risk of worker and vehicle interactions in mines. Engineering and administrative controls should always be considered first while conducting risk assessments for workers at any mine site. However, proper personal protective equipment (PPE) and clothing that improves the visibility of workers always remains an important consideration. The hazards in mining activities depend on the type of work being done as well as the environment in which these activities take place. Hazards related to worker visibility may be very different in a mill or refinery than those in a gravel pit or an underground mine. HVSA allows workers to be visible to equipment operators in conditions with reduced visibility. A pedestrian worker in an area with noisy machines in operation may not be able to hear oncoming equipment due to the noise. It is very important that workers are as visible as possible to equipment operators in the area to protect their health and safety. The Canadian Standards Association (CSA) has developed two separate standards on HVSA. CSA Standard Z96-09 provides guidance on the design and manufacture of high visibility safety apparel. CSA Standard Z96.1 was developed as a guide for the selection, use and care of HVSA. The specifications established in the CSA standards have been recognized as industry best practice, and should be considered for workers who work on surface in daylight hours. As of July 1, 2016, workers who are working underground or on surface between sunset and sunrise will need to wear clothing that meets new requirements set out in Regulation 854. While the regulatory requirements are generally consistent with the CSA standard, they are slightly more restrictive. Specifically, the regulation requires that the high visibility safety apparel must be made of fluorescent or brightly coloured background material. Workplaces must comply with the new requirements set out in Regulation 854, not the CSA standard; however, the CSA standard may still be a helpful resource. Class 2 garments offer full coverage of the area between the waist and the neck with retro-reflective striping on fluorescent background material. As per the CSA standard, background materials of HVSA must be fluorescent and can be yellow-green, orange-red or red. Flame resistant (FR) clothing, however, is manufactured from material that cannot hold fluorescent dyes; these garments can be bright yellow-green or orange only with no fluorescent properties. The striping must be 50 millimetres wide and is composed of retro-reflective or combined performance materials with a Level 2 photometric performance level. Coverage on the sides of the torso area must include at least 50 per cent of the length of the entire garment. Stripes near the bottom edge of any garment must be at least 50 millimetres from the edge. 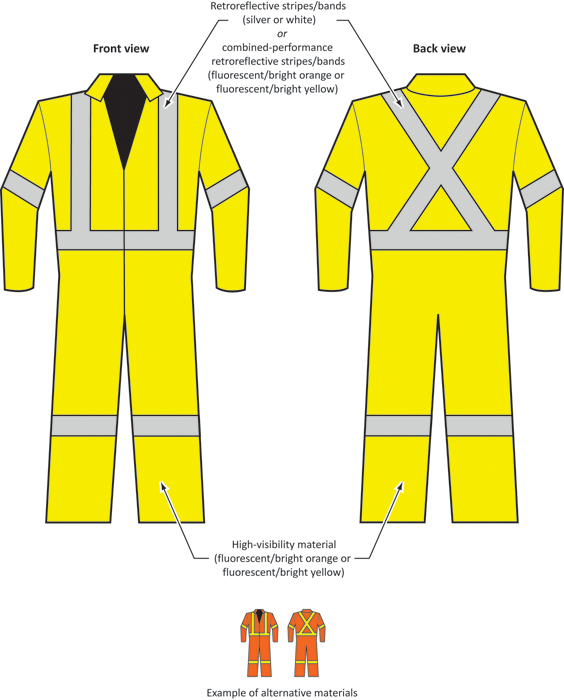 Class 3 garments provide a greater degree of visibility to the wearer and are recommended for workers in conditions that are dark and/or have very low light. Class 3 includes all the requirements of class 2 HVSA with the addition of retro-reflective striping on each limb. Retro-reflective stripes on the arms and legs can provide visible clues about the motion and direction of travel of the wearer of the garment. The distinctive configuration of the stripes ensures that some sections of the striping will be visible from all angles around the body (360° visibility) at all times. As of July 1, 2016, Regulation 854 will also require that high visibility safety apparel be made of fluorescent or bright coloured background material. This will help to provide greater visibility of workers in reduced light conditions. Note: Diagrams were reproduced with the permission of CSA Standards from CSA Z96-09 - High-visibility safety apparel which is copyrighted by CSA Standards, 5060 Spectrum Way, Suite 100, Mississauga, ON L4W 5N6. While use of this material has been authorized, CSA shall not be responsible for the manner in which the information is presented, nor for any interpretations thereof. Surface workers who work in very low light or night-time conditions (between sunset and sunrise). These times can be found at various websites such as Environment Canada Weather, The Weather Network, using a Global Positioning System (GPS) unit, or from various news agencies that provide this type of information. As of July 1, 2016, every worker in an underground mine and, between sunset and sunrise, every worker on the surface, must wear high visibility safety apparel that meets the requirements of sections 262 and 263 of Regulation 854. For optimal safety and performance, HVSA garments should be fitted specifically to each person who will wear them, with consideration given to additional clothing. For example, space must be available inside coveralls for any additional layers of clothing that will be added and removed as temperature conditions change. Another layer of clothing should not cover high visibility safety apparel, unless it is also HVSA of the same class or better. The fit should be relaxed enough to allow for freedom of movement for all normal work activities. Dirty/worn retro-reflective materials provide lower visibility than clean and well-maintained ones. Machine wash HVSA alone or with like colours in warm or cold water on a delicate cycle using a mild detergent. During washing, do not use bleach or fabric softener as they can degrade the FR (flame resistant) and retro-reflective properties of the materials. Clothing should not be ironed or dry cleaned. Avoid washing HVSA with rough clothing (i.e. jeans). The glass beads on the retro-reflective tape can be worn off by rough contact. If possible, turn HVSA clothing inside out for laundering. Hanging HVSA to air dry rather than using a dryer will extend the life of the garment. The heat of the dryer can degrade the retro-reflective properties of the material. HVSA that is heavily worn, torn, soiled or otherwise contaminated should be replaced as it may no longer provide adequate levels of visibility. The Canadian Standards Association has a related guideline: CSA-Z96.1, Guideline on Selection, Use and Care of High Visibility Safety Apparel. Workers in exceptionally cold work environments may require insulated outerwear. As of July 1, 2016, the outerwear must also meet the requirements set out in Regulation 854 for high visibility safety apparel. In the case of very wet environments, appropriate HVSA rain gear can be provided. Retro-reflective tape/material must also be applied to head gear worn in surface and underground mines. As of July 1, 2016 retro-reflective material must be applied on the front and back of head gear as well as both sides to provide 360˚ reflectivity. Retro-reflective material should also be applied to ear muffs to ensure that the tape on the sides of the head gear cannot be obscured. Other stickers should be placed on head gear in such a way as to not obstruct the retro-reflective tape. Note: The following terms are not defined in the Occupational Health and Safety Act or its regulations and are provided for reference purposes in this guideline only. High Visibility Safety Apparel (HVSA) is clothing that has colouring and retro-reflective striping that enhances the visibility of workers to others. Approved high visibility safety apparel is clothing that complies with the CSA Z96-09 High Visibility Safety Apparel Standard. CSA Z96-09 details specifications for clothing that is (a) capable of visually signalling the wearer’s presence to others and/or (b) providing a high level of visibility under any light conditions and in a beam of illumination from vehicle lights. Classes are categories by which the Canadian Standards Association rates high visibility safety apparel in respect of body coverage provided. Class 3 provides for the greatest amount of body coverage (360°). Class 3 therefore provides the best visibility in poor light conditions and at the greatest distances. Photometric performance level is the level of effectiveness of retro-reflective material in returning a reflection of light to its source and appearing brighter. All class 2 and 3 rated HVSA must be provided high visibility retro-reflective striping with Level 2 photometric performance. Flame resistant (FR) rated clothing must have FR rated striping materials. Background material is bright coloured or fluorescent material intended to be highly conspicuous, but not intended to provide retroreflective performance. Bright coloured material is textile material that emits most of the optical radiation absorbed in a specific colour range. Using bright coloured material provides another option intended to create conspicuity against most work environments. Fluorescent material takes a portion of invisible ultraviolet light from the sun and sends it back to a viewer as enhanced visible light. This material only works where there is a source of natural sunlight, so it would not be appropriate on its own in underground conditions. Fluorescent material appears brighter than similar coloured non-fluorescent material under low natural light (e.g., cloud cover, fog, dusk, dawn, etc.). Retro-reflective material will return light in the direction of a light's originating source. This property of this material lets a driver or other viewer with a light source see the light reflected from the retro-reflective material on a person's clothing any time the person is standing within the light's beam. Retro-reflective materials are most effective under dark and low-light level conditions, making them suitable for underground use when there are directional light sources. Combined performance retro-reflective material is a material that is both retro-reflective and fluorescent. Flame resistant (FR) clothing is made of material that is formulated to self-extinguish when a source of flame or ignition is removed from contact with it. Call 1-877-202-0008 any time to report critical injuries, fatalities or work refusals. Call 8:30 a.m. to 5 p.m. Monday to Friday for general questions about workplace health and safety. Always call 911 in an emergency.